This is time of year animal sightings are on the rise. 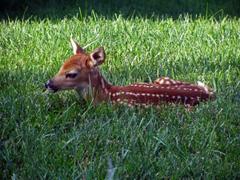 Many animals are indigenous to the area including deer, coyote, fox & bear and they are giving birth to their young. Often at times you may find or see the young on their own as the parent is away feeding. Do not attempt to approach or touch the young as the parent may be near.